The Bobcats are now tied in third place in the NEC with Sacred Heart, Robert Morris, and Long Island. 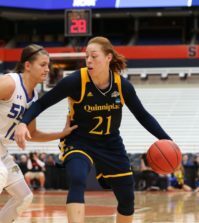 Quinnipiac will host second-place Monmouth University, Monday at 7 p.m as the Bobcats try to get a home game for the playoffs. Prior to the game, Quinnipiac (14-14, 11-6 NEC) honored its four seniors, Alyssa Jann, Lailah Pratt, Courtney Kaminski and Mia Picillo for their hardwork and dedication to the program. But it was the defense from a junior and the rebounding from a freshman that led the Bobcats to victory. 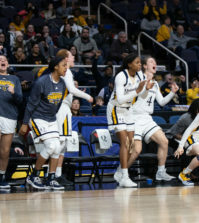 “Kari Goodchild did a phenomenal job on Mariyah Laury, the second leading scorer in the conference,” Quinnipiac head coach Tricia Fabbri said. Goodchild held Laury to only four field goals, but still led the Knights with 15 points. Goodchild made an impact on the offensive end too, scoring a game-high 17 points, while shooting 6-for-8 from the field and 3-for-3 from 3-point range. Freshman Brittany McQuain continued her double-double streak with 13 rebounds and 13 points, giving her three straight and seven for her career. 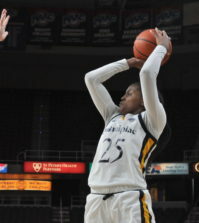 Junior Jacinda Dunbar added 15 points, nine rebounds, and four assists. “This was our most complete 40 minutes of play,” Fabbri said. The Bobcats out rebounded the Knights 54-29 and shot 40 percent from the floor. After only leading by three at the end of the first half, the Bobcats regrouped and came out strong both offensively and defensively in the second half, as they went on a 17-5 scoring run. They held the Knights to seven field goals in the second half and just 15 overall. 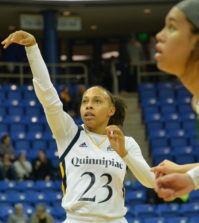 Fairleigh Dickinson (14-14, 7-10) scored 13 of its 30 first-half points on the foul line, as the Bobcats experienced serious foul trouble early. The Knights never came closer than nine points after Quininpiac’s run to start the second half.